Marvel’s Spider-Man launched alongside a snazzy PlayStation 4 Pro bundle which included the game, a stylish PlayStation 4 console adorned with a white spider logo and a red and white DualShock 4 controller. But what about those on a budget without an expensive 4K TV who want a new console to play Marvel’s Spider-Man on though? From the website The PlayStation Brahs comes hope that a Marvel’s Spider-Man PlayStation 4 slim bundle could drop for this holiday season. 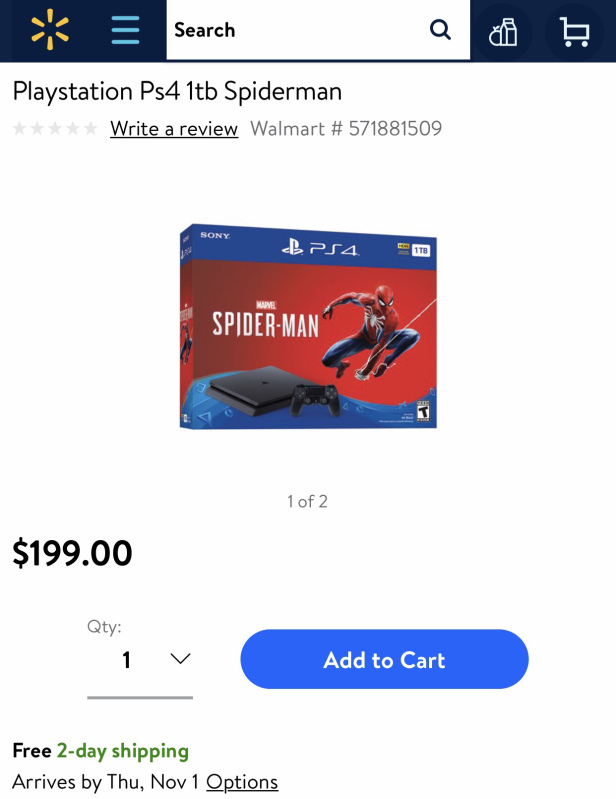 The website posted a listing from the american Wal-Mart website for a Marvel Spider-Man PS4 slim bundle that has since been pulled but not before an image of the ad could be captured. The image lists the console bundle at $199 USD (around $261 in CAD) but unfortunately the image looks like it will just be a vanilla PS4 without any of the frills of the Pro console which is disappointing. I’m sure there’s some – me – who would consider buying something like this given the price point. Given the record-breaking success of Marvel Spider-Man, there’s little reason to doubt that this won’t get formally announced soon in time for the holiday season. A $200 USD console with one of the biggest PlayStation exclusives starring one of the most popular characters on the planet earth for sure wouldn’t stay shelves for very long. More as it develops.